Experience the delicious taste of a mocha drink from your local coffee shop in the comfort of your own home! 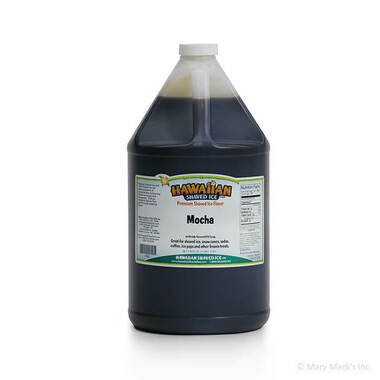 Mocha flavored sno cone syrup from Hawaiian Shaved Ice allows you to enjoy yummy mocha drink infused with chocolate milk, as an icy treat. With a sophisticated taste like this, everyone will want a bite! Sit around with friends and imagine you are in a coffee shop when you bite into this snow cone. This chocolately treat is one that kids and adults alike can enjoy together because everyone loves the rich flavor of mocha! Purchase a gallon of mocha snow cone syrup flavoring today. It will be hard to say no to the rich mocha-chocolate taste; make sure you have enough for the whole crowd at your next party or get-together! 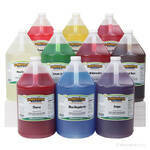 This flavor can also be purchase in a quart size, or it can be combined with other great shaved ice flavors in an assorted package.